"The tower, which will cost $1.2 billion and take 63 months to build, will include a Four Seasons hotel, apartments and condominiums, office space and the world's highest observatory. 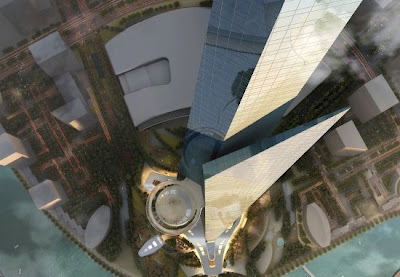 It will be at least 568 feet taller than the Burj Khalifa. 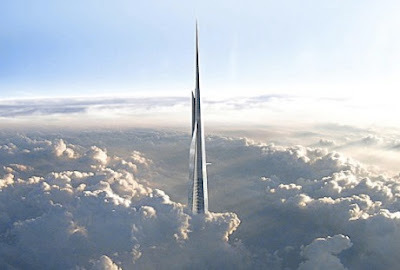 [...] There's something very special about being the world's tallest building. Everyone wants to be able to do one. I think in this situation there is a development going around the tower -- a $29 billion development -- and this tower acts as a catalyst for that development. Putting such a tall tower in first actually increases the land value around the tower, so even if you don't make a lot of money on the tower itself you'll make money on the land. [...] What struck us is that Saudi Arabia is trying to open itself up to more business and more opportunity. So we thought about the fact that this is a new vision for Saudi Arabia, and the idea of newness struck us. We thought about how the palm tree, when it's just starting out as a plant, it will grow to a point and then the prongs will separate. The building is not a replication of that but the idea influenced us. 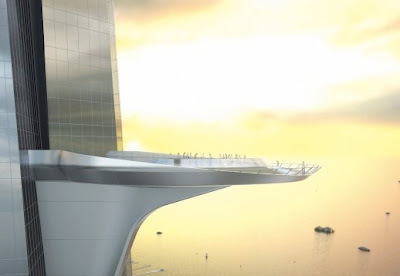 [...] The idea started out as a helipad, and we came up with the projected, cantilevered dish. And then we started talking to pilots and they said, 'Well, up at that height it's going to be pretty difficult to land.' But the owner and we liked it so much that we thought we'd keep it as a sky terrace. It'll have a little garden; don't forget, six months of the year here it's a beautiful climate. The winter here, temperature wise, is a lot like living in California."